I am experiencing some difficulty in getting my TT S2-1600 operating with my WIN7 32 Bit system. I have the following error messages in VerifMatos V3.0 - hopefully someone can advise further as I am running out of patience. ->Une carte avec pilote SAA7146A detectée. Identification du demodulateur STB0899 correcte : chip_ident($2), release($0). You can use last version to check your card, with English sentences. But I think your problem will not be solved. 4F1C is an unknown value for me. S2-1600 product ID is "101C"
S2-3200 product ID is "1019"
Have you also tested the Technotrend BDA driver given with this card? What say your Device Manager about this card? If it is really a TT S2-1600 I can change value in software for your card. I have spent maybe three weekends trying all sorts of things - drivers install, delete, reload etc. in an effort to get the card to function correctly. I have also tried the card in two different computers one running WIN 7 64 bit and the other running WIN 7 32 bit without success. The strange part is that the computer which is now running the WIN 7 32 Bit operating system (after I upgraded the operating system recently from XP) originally had the card installed and it did work sometimes under the previous XP system. When I say it did work "sometimes" under XP it was very unstable in so much that it would work fine one day and the next day it would not...this is why I decided to try WIN 7 32 Bit. I agree with your diagnosis it seems the card has an incorrect product ID number ..... how this has occurred I have no idea but I think the solution for me is to purchase another s2-1600 card. The latest version of VerifMatos is EXCELLENT in assisting with fault diagnosis - Many Thanks! If CheckTutiouneDriver gives you always same Product ID, I can build a special version of Tutioune1600 for your card and send it to you. You could test if there are no others strange results with this card. Thank you for the custom file I do appreciate your assistance and support. In addition - When opening the custom file i received the following message "could not use the universal source filter"
Also - "OPERATION EN VIRGULE FLOTTANTE INCORRECTE"
I have now ordered (purchased) a replacement s2-1600 as I think your initial prognosis is correct - there appears to be something odd about this card. My new card arrived today and it seems it has worked first up! I now have all 5 LED in Green! It seems that the original card was in fact faulty. Well, I'm happy to know you have a good card now. I now have some limited success with the new card however I am receiving the message "impossible to render video"
Play TS from file - All red LED's - When I press this button I receive the message " An object or name was not found ($80040216)"
DMA Type 1 - Both LED's are green. 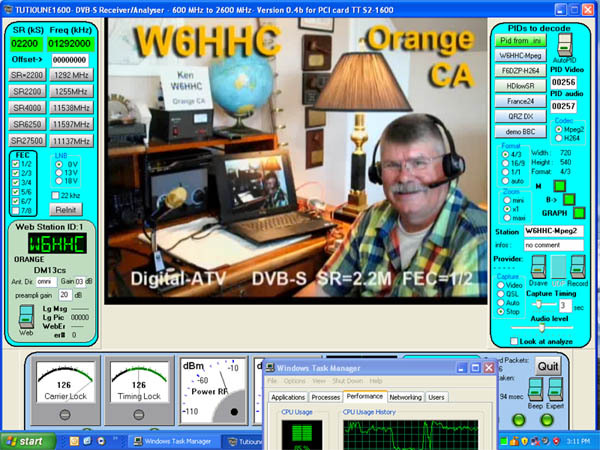 I have plugged an antenna feed into the S2-1600 card from my satellite dish and I can monitor (see) the data streams from a known transponder but I am unable to demodulate the video. Do you have any thoughts/suggestions. You can send me a snapshot of Tutioune in EXpert mode? I could say more. I have two areas of questions on v0.4b. I am not sure whether to start a new topic...or to add my question to this topic? I am using S2-1600 board on very old Pentium4 (1.8 GHz) on WinXP. My STB receiver and my SatLink WP-6918P DVB-S monitor tool do not suffer any video interruptions. Another question is concerning the English language "http://www.vivadatv.org/viewtopic.php?f=61&t=235#p580" user explanation info. The display page is too wide for the settings I use on my PC display. I can not see details on right side of information...if I try to print to PDF...the information does not get captured (cut-off) on the right-hand side. My second question is "is it possible for you to put this TT1600 Explanation Details document into a PDF, perhaps in landscape-format?, so that it can be downloaded for offline reading? Last edited by W6HHC on Tue 25 Feb 2014 00:32, edited 2 times in total.